What are some of the top things we learned for fantasy football in Week 16 of the 2018 NFL season? Fantasy football is an ever-changing game, and what we thought was a sure thing a few weeks among might not ring true anymore. Below are seven things we learned from Week 16 of the 2018 fantasy football season. 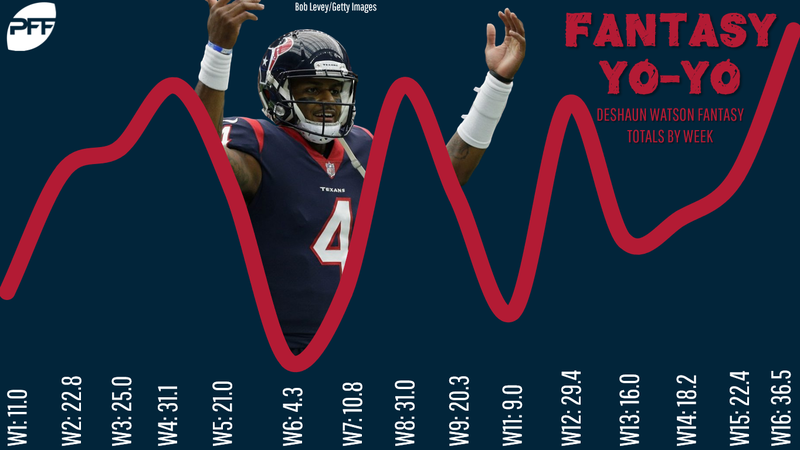 Lost in Patrick Mahomes’ insane 2018 season is that Watson had an equally insane 2017 season (when he was healthy). Watson has only sporadically flashed that ceiling this year — more so at the start of the season — but we saw it in full force in Week 16, as Watson dropped 36.5 fantasy points with 339 yards and two passing touchdowns coupled with a pair of rushing touchdowns. And let’s not forget that Watson was/is playing without Will Fuller, Keke Coutee, and Lamar Miller. CMC set the running back reception record this week after catching 12 passes against the Falcons (a team he caught 14 passes against earlier in the season). Oh, and he ran for over 100 yards for the third time in the last five weeks. A true volume-monster and the best receiving back in the NFL, what’s the real case against McCaffrey as next year’s No. 1 overall pick in PPR leagues? That’s not something we could say about Williams at the start of the season. But he has been solid since Aaron Jones went down. Williams collected 95 rushing yards on 15 attempts (6.3 YPC) while adding 61 yards on six receptions through the air (with a very strong nine targets). He also scored a touchdown for the second straight week, something he had only done once from Weeks 1-14. Anderson put together his third strong game in a row and fifth straight game with an improved stat line since the Jets’ bye. Since then, he’s gone 2-22-0, 4-44-0, 4-76-1, 7-96-1, and then Sunday’s 9-140-1 line. 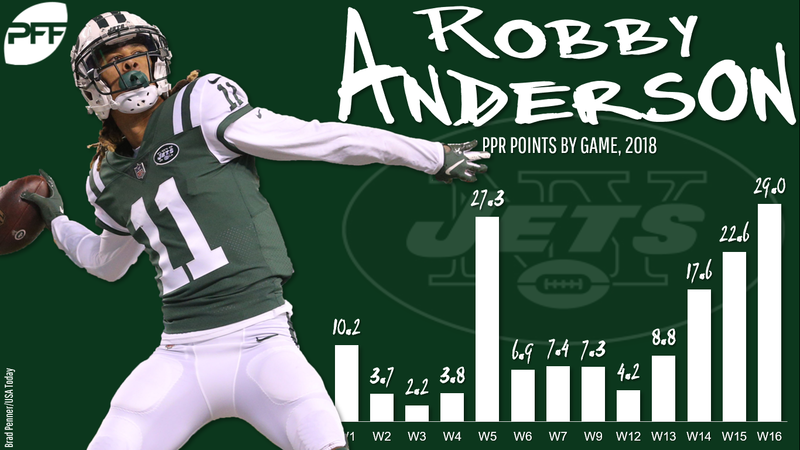 Anderson has fully taken over as the team’s best offensive weapon, and it’s working out for the Jets. His 13 targets this week are in elite territory, and his ability to come through in three consecutive weeks with increasing volume (and defensive focus) is a testament to his skill and bodes well for him in 2019 as Sam Darnold improves. There’s only one more week for this to come to fruition, but Hilton is long overdue for a touchdown. He had yet another huge game in Week 16, dropping a 7-138-0 line on the Giants on eight targets. 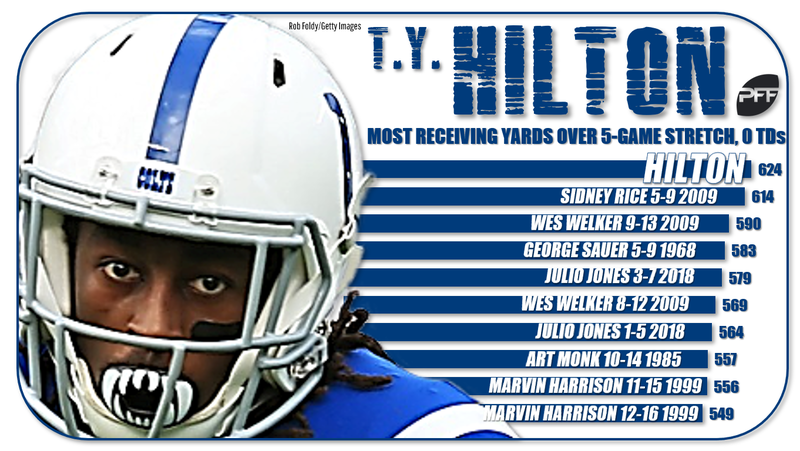 Since Week 12, Hilton now has 36 receptions for 624 yards (125 per game) … and no touchdowns. He’s been playing lights-out football but hasn’t been rewarded with touchdowns in too long. 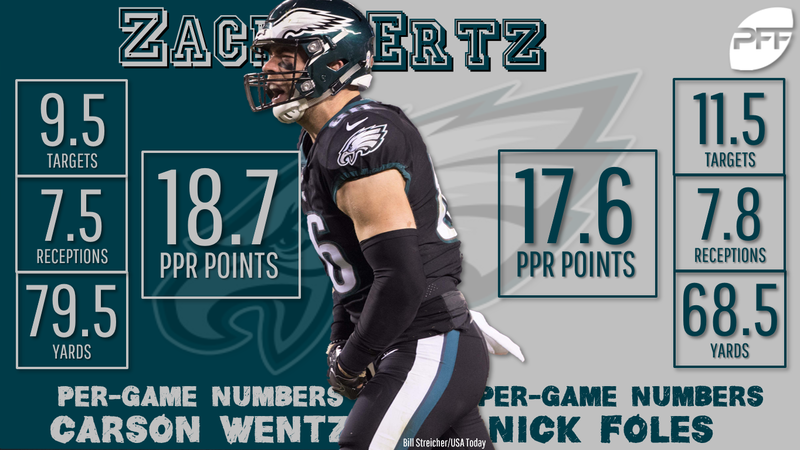 People panicked with Ertz had just three receptions for 22 yards in Foles’ first game under center since early in the season, but Ertz rewarded the patient with a monster 12-110-2 line in Week 16. It was his second game of the year with over 35 PPR points, an unheard-of number for tight ends. It’s unclear how long Foles will be the starter — and the Eagles season might be done after next week anyway — but if they do squeak into the playoffs, you can obviously trust Ertz in DFS regardless of who is at quarterback. Not to go too Jets-heavy with this article, but McGuire, much like Anderson, has been playing solid (fantasy) football over the last three weeks. His real football performances haven’t been all that good — he is averaging a paltry 2.8 YPC over the last three weeks — but he does have four total touchdowns in that span with exactly three receptions in all three games. Still just 24 years old (he’ll be 25 next year), McGuire will be a breakout candidate if he’s the Jets’ lead back next August.